Another glut of carrots in the veggie box. I almost made Ivy’s lovely carrot cupcakes again. But then I realised I could knock off another recipe from Delicious Days, so I made Good Morning Muffins instead. 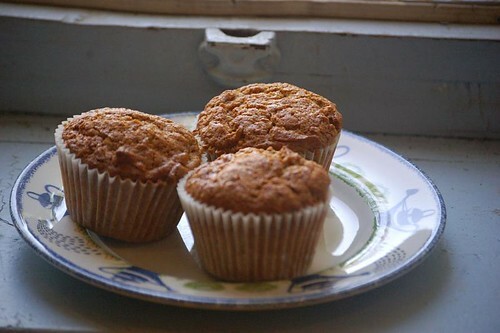 These are American-style muffins with toasted ground hazelnuts, grated carrots and some sliced apple. Verdict: they were OK, but I’d rather have made Ivy’s cupcakes! It has to be said I’m not that keen on American muffins. Still, it means we have something different to eat from breakfast instead of terminally boring wholeweat cereal. 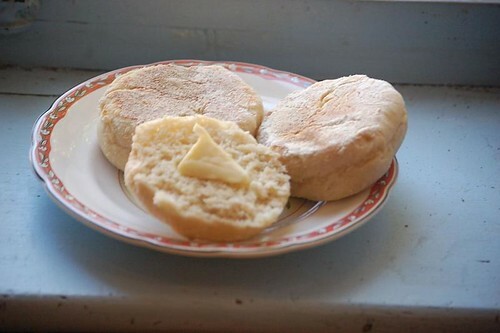 Meanwhile, I also decided to have a go at making English muffins. These are something we do occasionally have for breakfast because you can get acceptable packaged ones in Carrefour. 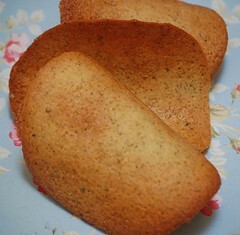 But I thought it would be nice to try making my own so I could put them in the freezer and have them whenever we like. I’d always thought muffins were tricky, but I found a recipe at King Arthur Flour that looked utterly straightforward and even let me dust off the bread machine to make the dough. I had to do some conversions and the initial batch turned out rather wet, resulting in oddly-shaped muffins, because the dough stuck to everything and was difficult to transfer from work surface to griddle. 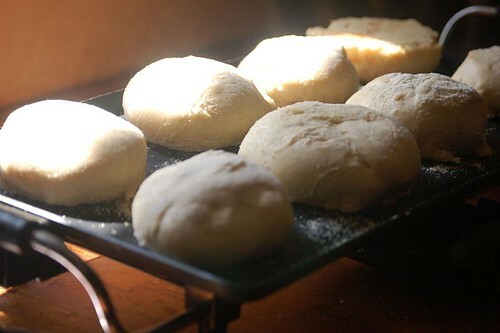 But I just added a bit of flour to the remaining dough and they turned out beautifully. I cooked them on my electric plancha, which is perfect for this and means you can cook them eight at a time. I split one and spread it with butter the minute it came off the griddle — yum! No more bought muffins for me! Following is my converted recipe. If you don’t have a bread machine there’s a manual version here — though I’d have thought that with a bit of common sense you could simply make the dough in the recipe below by hand. Update: my bread machine finally packed up. Now I make these in the stand mixer, using the flattish beater (not the dough hook). Just beat at medium-high speed for 5 minutes till the dough is stretchy, then leave to rise in the covered bowl for a couple of hours before continuing as for the bread machine method. Well, no-one is ever likely to want to make a film about my attempt to cook my way through Delicious Days, so perhaps I needn’t feel too bad about falling off the wagon. 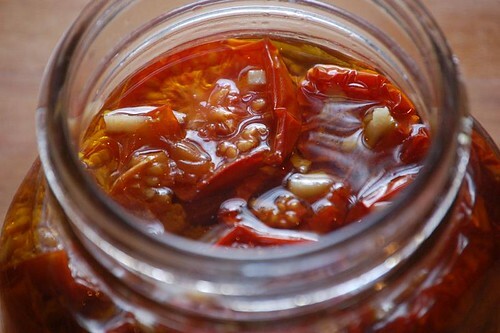 I suddenly realised that Nicky had a way of using up some of the glut of tomatoes in our weekly organic vegetable box, so I quickly did a batch of these dried tomatoes. Barely a recipe: just halve or quarter your tomatoes, season with salt, pepper, garlic, and herbs to taste, and leave in a 90-degree oven for several hours till they are dried to your liking (I also used the residual heat after I’d used the oven for something else). Even if I haven’t kept up with the challenge too well, I have still cooked more from this book than I might have done otherwise, and found some brilliant keepers — especially the ginger and lemon cordial, which is destined to become a summer standby, and the coffee panna cotta. I shopped for this on the basis of the title, and it turned out to include quite a few less obvious ingredients that I didn’t have — chives, lime zest, and chilli for example — so I had to make a few substitutions, namely basil and my faithful standby chilli sherry (thank you for this idea, Fiona!). It’s the same basic idea as garlic bread — the flavoured butter is spread liberally onto slices of baguette, and then you can either bake the slices till crisp as I did, or use the classic method of wrapping the almost-sliced-through and buttered loaf in foil and baking it. It was much appreciated, and definitely a keeper. Just in case you thought this blog was abandoned, here I am! Life is busy in the summer and I don’t have much time or opportunity to cook. I actually first made this recipe from Delicious Days about six weeks ago. Since then, I have made literally gallons of the stuff, served at village events as a non-alcoholic cocktail. It has been a huge success with both adults and children — we’ve sold 10 litres in a matter of minutes — and it is so easy and cheap to make. This is a slight variation on the original recipe. I took the opportunity of Steve being away to try this dish from Delicious Days — I knew he wouldn’t appreciate being served up a dinner consisting of a plate of tagliatelle with no sauce to speak of. Actually it’s a lot better than it sounds, and it can’t be faulted on the effort-versus-results front, as well as being very economical. You simply boil your pasta and dress it with the zest and juice of a lime, some chilli flakes (I used my standby chilli sherry instead), plenty of black pepper and olive oil, and a splash of the cooking water to loosen it all up. Salad dressing, basically. Swill it around so all the strands are glossy with oil and sprinkled with specks of lime zest and pepper, add plenty of Parmesan, eat. Excellent stuff! Well, I will never catch up with Maggie, because she has already done more recipes than there are in my whole book. But here I am with two recipes in two days. 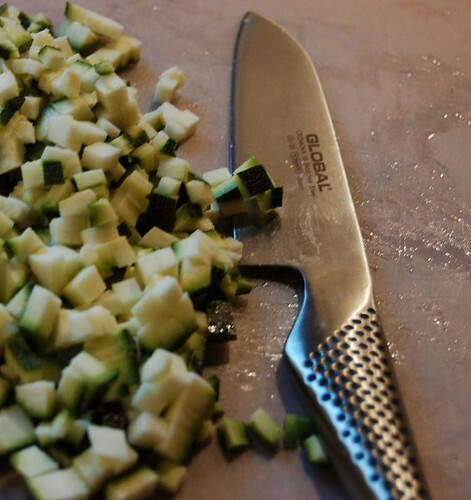 Thank goodness for my Global knife, the best tool I’ve ever had for chopping vegetables. This recipe requires you to dice courgettes and aubergines to the size of grains of rice. I’m not the best chopper in the world, but with this knife I did it tolerably well in about 10 minutes. The veg are sauteed and then added to a classic plain risotto, which is served with lamb cubes threaded onto rosemary twigs and pan-fried. Actually I grilled mine using my cast-iron grill pan, because it’s the best way of quickly cooking meat so that it’s caramelised on the outside and still pink on the inside. 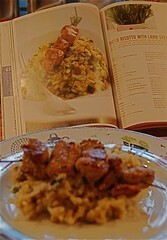 It was nice; I liked the way the flavour of the tiny dice permeated the risotto. For a vegetarian version, it would be good with grilled halloumi cheese, which could also be threaded on skewers. Time to pull my socks up and get on with my Cookbook Challenge — only a dozen done, and Maggie has raced ahead with 80-odd! This evening we ate papillottes of feta (or rather French imitation feta, which can no longer be called feta since it doesn’t come from Greece) baked in foil with spices (pepper, cumin, chopped chilli), herbs (oregano and garlic) and branches of cherry tomatoes, with a glug of good olive oil poured over the lot. Very nice — it makes a good vegetarian starter with some green salad and plenty of good bread to mop up the melted cheese and delicious juices. I can imagine cooking these on the barbecue at the height of summer. Bet you thought I’d forgotten about my cookbook challenge, didn’t you? Things have been going on in the background though — not all of them entirely successful. Due to “technical difficulties” there is no photo of this particular recipe from Delicious Days, but it was really lovely. In a glass, a layer of panna cotta is allowed to set for a few hours, and is then topped with a thin layer of coffee jelly. I let the coffee cool for 10 minutes as instructed, and spooned it carefully onto the panna cottas. They looked lovely, a symphony in black and white. But when I took them out of the fridge a couple of hours later, the still-liquid coffee had managed to insinuate itself down the sides of the glasses in dark streaks, so it really didn’t look very attractive! It tasted gorgeous though, the strong coffee complementing the mild creaminess of the panna cotta perfectly. Next time — and there definitely will be a next time — I will let the coffee almost set before adding it. I twiddled the recipe a bit; the coffee was actually supposed to be Kahlua, but I’m not a liqueur drinker, and I wasn’t about to buy a whole bottle just for this. I first discovered Delicious Days via Nicky’s recipe for coffee jelly, so it seemed entirely reasonable to use this: I just made a cup of very strong espresso and sweetened it before adding the gelatine. Taking a leaf out of Pascale‘s book, I also substituted a couple of tablespoons of crème fraîche for part of the cream; I’ve done this before and it really enhances the flavour of the panna cotta, especially when you can only get nasty UHT cream. It still amazes me how something as simple as “boiled cream” can be so very good. I’ll take this opportunity to mumble quietly about a couple of other less successful attempts from the book: the smoked trout, red onion, fennel and orange salad was a nice idea, and looked attractive, but there was far too much onion, and we felt the flavours didn’t really work together that well. No photo, we were entertaining and I didn’t have time to take one. The caramelized almonds suffered from my following the instructions too closely; “after 5-8 minutes the liquid will have evaporated and the sugar covers the almonds with a dry crust”. This didn’t happen, and I was just musing that the cinnamon in the syrup made it hard to see just how caramelized it was when — sniff, sniff — aargh! I snatched the pan of the heat and quickly tipped the almonds onto the prepared baking tray. They were only just the right side of burnt. I didn’t photograph them because they would have looked like cockroaches, but if they had been just a fraction less done they would have been really nice. As it was, they were still OK as a nibble with drinks. Another slightly disappointing experience from delicious:days. This was OK, but it tasted bland (read: not lemony enough) and had a grainy texture around the edges which I didn’t particularly like. 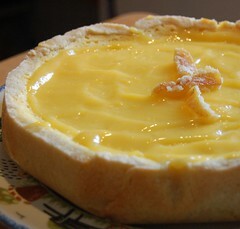 It also has a rather solid pastry case instead of the usual crumble base. As part of the same baking session I had made some lemon curd with a big bag of bargain lemons, so I improved it by spreading this over the top and adding a garnish of crystallised lemon peel. Sorry Nicky, but I prefer my own lemon cheesecake!